Not just any meatballs, but Swedish meatballs. We used to eat them for lunch at my small high school in Luxembourg. On those days, I made sure to bring enough money to buy two portions. The bellyache was worth it. When made perfectly, Swedish Meatballs are tender, but do not fall apart, thanks to the perfect balance of breadcrumbs and cream. After a brisk sizzle and shake in butter, they brown up and fill the kitchen with the delicious scent of fried onions (thanks to the grated onion that’s been worked into the mix). Sneak a meatball from the pan, and you’ll discover the glory, complex flavor, thanks in great part to a blend of good quality meats (usually beef, pork, and veal, although many just use beef and pork). Somewhere in the background, there’s a ghost of something else. You might never figure it out, unless you were the one who made them: nutmeg. But don’t eat them all while standing, barefoot, in front of the still-sizzling pan. Set them aside a moment, if you can stand it, and throw together a quick sauce with cream, chicken stock, and a spoonful of lingonberry jam. Pour the sauce over the meatballs and a heaping of egg noodles. Or perhaps some mashed potatoes. Either way is as Swedish as it gets. Makes at least 60 1″ meatballs. 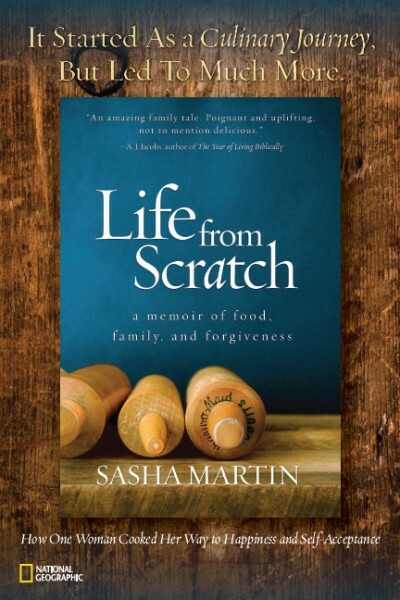 Recipe inspired by several sources, including Marcus Samuelsson. Let’s go to Sweden! There’s no quicker way than with Swedish Meatballs. Stockholm. Photo by McKay Savage. 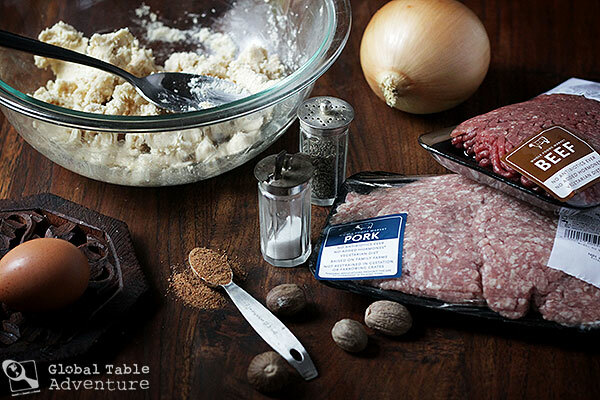 Add all meatball ingredients to a bowl. Mix thoroughly with hands until smooth. Be sure to include ALL those juices from the grated onion, as they add both great flavor and important moisture. Note: Do NOT mix the cream with the breadcrumbs ahead of time, as many recipes suggest. 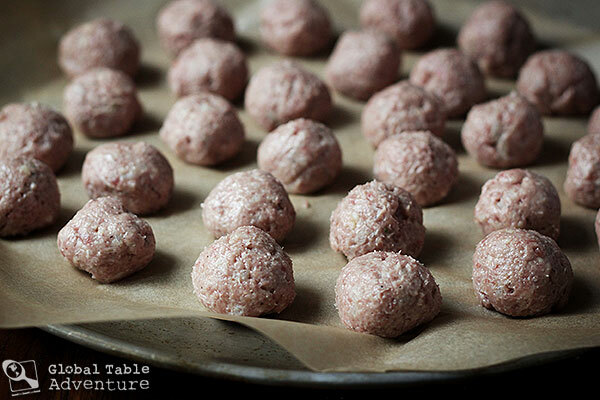 The mixture is too dry and will leave clumps in your meatballs. (You can use a food processor, if you’d like the meat ultra fine and smooth). Form into small meatballs, about 1″ in diameter. I found using a measuring spoon to scoop out the mixture before shaping kept the sizes pretty equal. A scant tablespoon should be about right. Keep a bowl of water at your side. If the mixture begins to stick to your hands, rub a little water on your palm. You can refrigerate the meatballs as you work. It goes quickly if you have a friend helping you. Fry in butter, in batches. Make them as brown and crispy as you’d like… that’s the best part! I cooked all mine in about four batches. You can keep them warm in a 200F oven, if needed. If there’s an excess of grease in your pan, pour it off. I didn’t bother with this, as I love the taste of butter and browned bits… and there really wasn’t much fat in the pan. Add the stock, cream, and lingonberries. Stir and simmer about 5 minutes. At the end of five minutes, the mixture will still be pretty thin, but it will thicken to more of a gravy once it cools a bit. Pour over the meatballs and egg noodles. 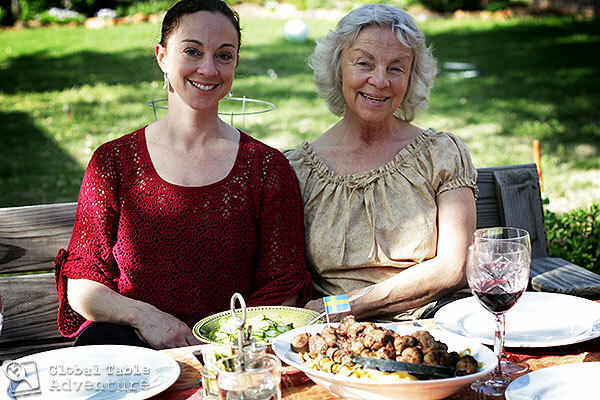 Our Swedish friend, Alex, and her mother loved this recipe! In fact, Alex asked for the recipe, which is the ultimate honor, coming from a Swede. Enjoy on a sunny afternoon with friends. P.S. I’m curious. 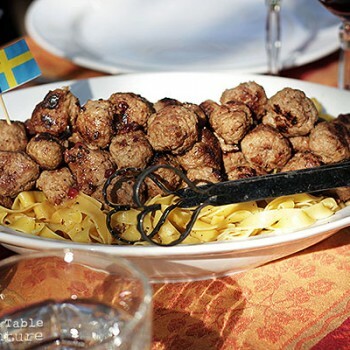 Have you ever had Swedish meatballs? Have you ever made them yourself? When made perfectly, Swedish Meatballs are tender, but do not fall apart, thanks to the perfect balance of breadcrumbs and cream. After a brisk sizzle and shake in butter, they brown up and fill the kitchen with the delicious scent of fried onions (thanks to the grated onion that's been worked into the mix). Add all meatball ingredients to a bowl. Mix thoroughly with hands until smooth. Be sure to include ALL those juices from the grated onion, as they add both great flavor and important moisture. (You can use a food processor, if you'd like the meat ultra fine and smooth). Form into small meatballs, about 1" in diameter. You can refrigerate the meatballs as you work. Fry in butter, in batches. Make them as brown and crispy as you'd like. Once done with the meatballs add the stock, cream, and lingonberries to the pan. Stir and simmer about 5 minutes. I found using a measuring spoon to scoop out the mixture before shaping kept the sizes pretty equal. 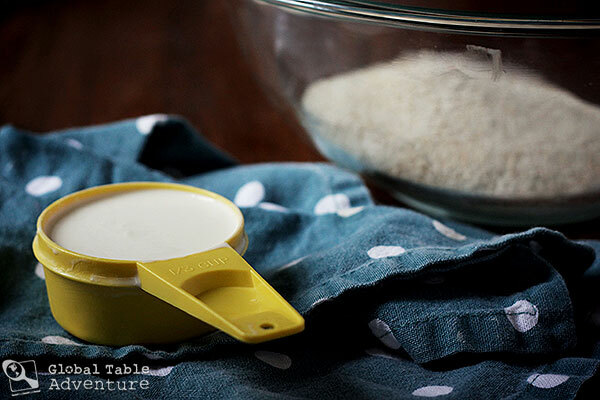 A scant tablespoon should be about right. I wish we lived closer to Ikea! If not for meatballs, then for the Princess Cake. So…your recipe looks about right to me too! At least based on my personal experience with Scandinavian meatballs. 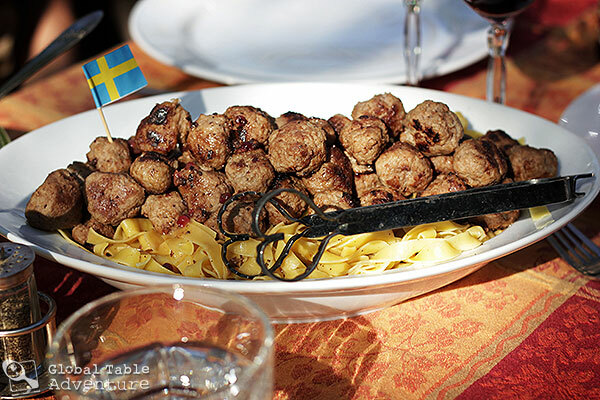 While I’m not an expert, I did recently have an Earth-shattering education involving Swedish meatballs that I’d like to share with you and your readers. My paternal grandparents are both second generation Scandinavian-Americans, Grandma’s family is from Norway and Grandpa’s family is from Sweden. Back in the 1950s in South Dakota where they got married, they were considered a mixed-marriage! How scandalous… well, not really. 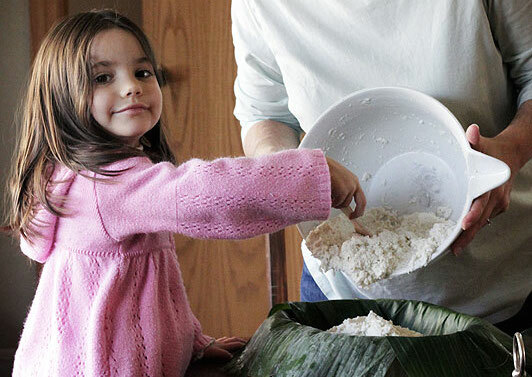 However, their backgrounds have continually influenced the kinds of foods we eat during holidays. Grandma tries to share both Norwegian and Swedish traditions alongside everything American. It’s a beautiful thing… until you realize you’ve been lied to your whole life. 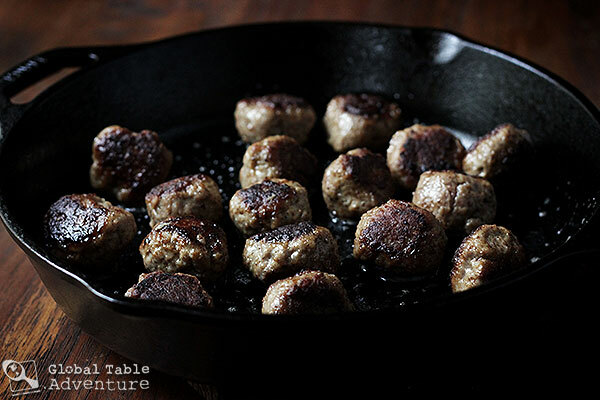 Which brings me to my Grandma’s Swedish Meatball recipe… she has been making the same recipe for years and has even shared it with my mother, who makes these meaty balls of goodness often. They are my favorite food and I request them when I go home for extended periods of time. I even make them in my apartment when I need a flavor from home. I did not know the recipe’s origin but I assumed it was adapted from my grandfather’s grandmother since she was direct from Sweden. The problem though came whenever I ordered Swedish meatballs at a restaurant, IKEA or tried to buy frozen dinner convenient meals… the meatballs of my childhood were DISTINCTLY different. 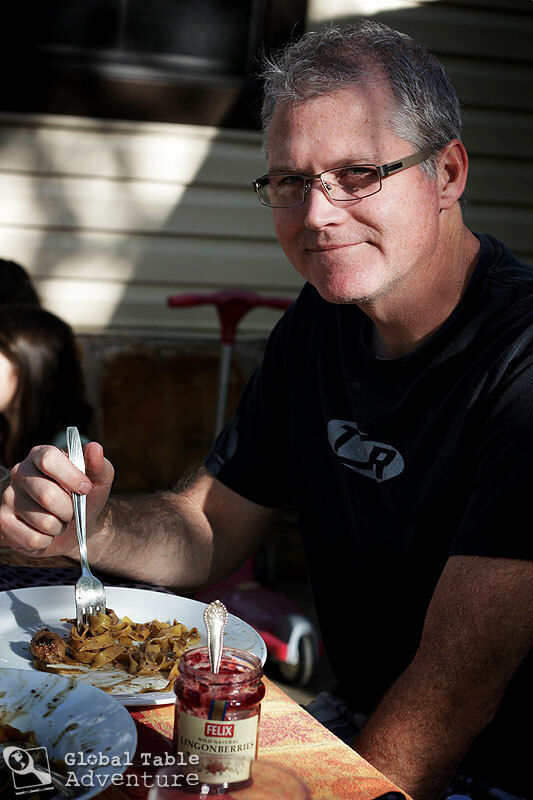 They were spicier…not heat, just more flavor… This was always a curiosity of mine. 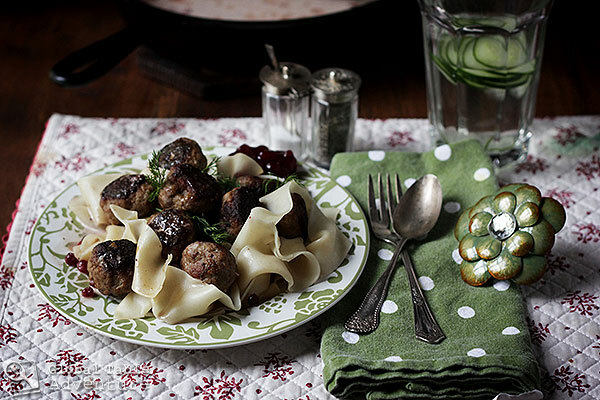 Why did my grandma’s recipe taste sooo different from all other Swedish meatballs available? Even IKEA’s. On a recent trip to IKEA with my grandparents I gained enough courage to ask her why her meatballs tasted so different. To which she replied, “Well, my recipe isn’t exactly Swedish.” WHAT!? My mind was sort of blown. “You’ve been eating Norwegian meatballs your whole life. And the spice difference is allspice, cloves and mace. I thought the label “Swedish” would be more palatable.” After I got over the initial shock of it all, I learned to embrace that Grandma just wanted us to love her roots just as much as Grandpa’s. kjøttkaker, Norwegian meatballs, are famous and were once voted Norway’s national dish. What a funny story! I love it, Rebecca! Gives a little insight into how easy it is for recipes to morph over time. These are awesome and I want to try them! Do you think the meatballs can be made in advance? Not fried in advance, just shaped into raw balls. Also if we make them, I think I’ll add less nutmeg, it has such a strong flavor. Definitely, Judi’s comment is spot on. whenever you get a craving for this delicious treat. I put them in a single layer in a Glad container. Also, I add sour cream to the gravy. Lignonberry jam is a must. Yum! Sour cream would be a nice way to thicken it… thanks for the tips, Judi! When I was growing up, my mom used to make “Swedish” meatballs from a Campbell’s soup cookbook. The sauce was made from cream of celery soup and dill pickles (along with a few other things, but those are the ones that I always remembered). We like them quite a bit. Married to a Norwegian, so I’m more a kjøttkaker girl. 🙂 Will be making these, though, because they sound delicious. I’m really going to have to try the Norwegian ones… it would be interesting to compare the flavors. I really like them with a little brown cheese added to the sauce. My mother-in-law does it when she’s got some scraps left, because the cheese slicer isn’t very effective when you only have a thin piece left. The sauce is still good without it. Brown cheese is worth trying on it’s own, though. My favorite way to eat it, so far, is to make cheese toast using rye bread. So good! My grandmother’s Swedish meatball recipe calls for no other spices but salt and WHITE pepper. Adding nutmeg seems wrong to me. I love any Swedish meatballs, though. It is vital to make them nice and small. And yes, lingonberry jam is vital. Another trick from my grandma was to soak the breadcrumbs in the milk for a while before adding the rest of the ingredients. Nice and moist. I bet he doesn’t notice it… the taste is just in the background… not something I think he’d detect on his own… unless he’s a super taster (http://en.wikipedia.org/wiki/Supertaster). Well, I recognize that smile in the photo of Alex and mother. Except I am in the audience and Alex, if I am correct Alexandra Bergman, is on stage as ballerina with Tulsa Ballet. Am I right? My husband’s mother was Swedish/Norwegian. 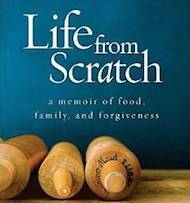 For years I tried to reproduce his grandmother’s meatballs, without success. He kept complaining that the gravy wasn’t right. One time his mother came to visit and I asked her what the secret was. She looked at me quizzically and replied, “I use a packaged gravy mix.” Argh! I am making these here in michigan and may not have access to ligonberry jam….is there a good alternate? Is it necessary to use lingonberry jam? Are there any subsitutes?